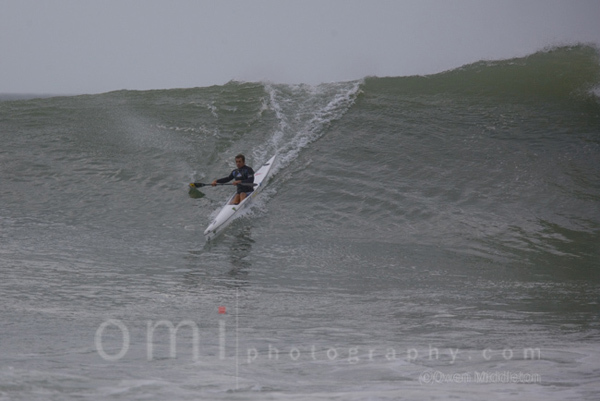 Dawid Mocke made no mistake in bagging the third Discovery Sunglass Hut Series race in Fish Hoek on Sunday. Nikki Mocke ran in an easy win in the women’s race. Dawid and Nikki Mocke were sitting behind the waves breaking on the point near Kalk Bay Harbor when they noticed onlookers yelling and waving at them. "We thought it was some of our buddies come to watch," said Dawid, "and it was only when I caught a wave in that I saw two people in the water." Seas: SW 14ft at 13sec"